Not surprising! It looks nuts in the manga and anime, too. Out of all the Yu-Gi-Oh characters, Yami Yugi has the most amazing hairdo. It’s always been tricky to replicate in real life. In a new series of ads, Konami tries to do just that—even if the result is more plastic hat and less actual hair. These “Are you dueling?” posters, which are for the latest Yu-Gi-Oh smartphone game, show rather normal scenes of life in Japan. 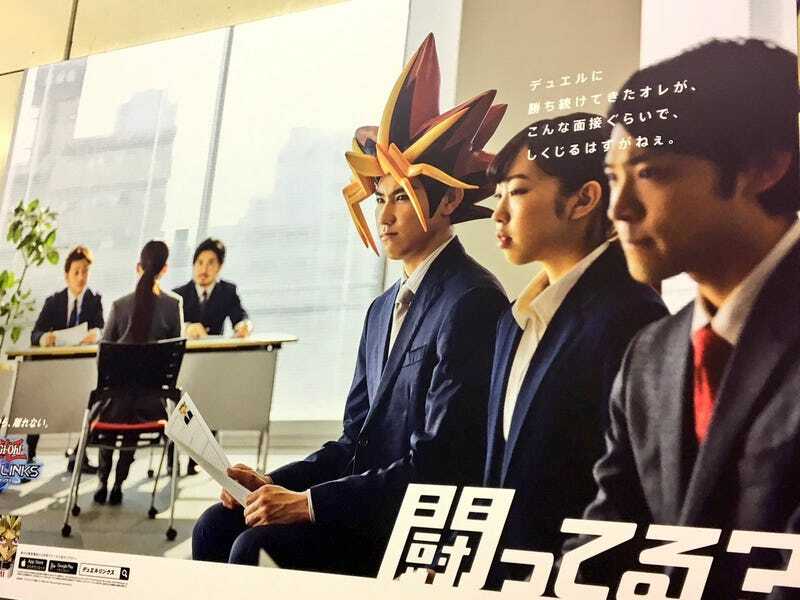 The simple addition of Yami Yugi hair makes the images anything but typical! There’s even a trailer truck during around Tokyo with this madness plastered all over it. Of course there is.